It looks like eventually we’ll be landing on more than arid planets and pirate bases when Star Citizen finally achieves its ambitions. Someone has found a detailed, sprawling city hidden in the game’s files. Continue your journey into the cosmos with our list of the best space games. Tucked in the game’s files is an interactive 3D model for something calledTerra Prime v2. 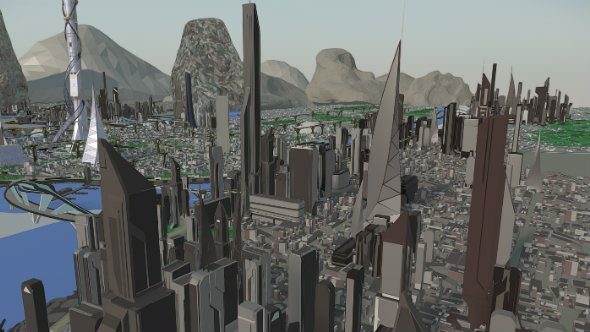 Split into four New York-style islands, Terra Prime is a huge metropolis, connected by bridges & elevated road networks, and dotted with skyscrapers & twisting monoliths. The model had to be majorly compressed by the dataminer to get it uploaded, so its lost a lot of its details, but it’s still impressive. It’s been extracted from the game’s files and reconstructed, so it’s had a bit of a rough time, really. It’d be nice to see it in all its glory, but we take what we can get. It will totally hammer your browser if you’re not at a desktop, so be warned – it uses around 2GB extra RAM.